Sister Caroline was a Child of God. She believed that and always tried to live as she believed. Caroline was born in Torre Dei Nolfi, Italy. After her parents moved to the United States, she grew up in Germantown, PA, where she attended Immaculate Conception Parish Elementary School and, later, which she so loved, Cardinal Dougherty High School. Prior to entering the Grey Nuns, Caroline worked for Curtis Publishing Company in Philadelphia. In 1964, Caroline entered the Grey Nuns in Melrose Park, PA. In the years following her profession of vows, Caroline served in several areas of ministry including Teacher Aide at St. Ann Hall Elementary School in Melrose Park, PA, chief cook at the Dominican Retreat House in Elkins Park, PA, Immaculate Conception Convent in Lowell, MA and our own Motherhouse in Yardley, PA. Caroline also studied Cosmetology and served our Sisters for 25 years in that capacity. Whatever Caroline did, she did it with all her heart and soul. I never saw her do anything without putting all her heart and soul into it. Carol was (is) a Child of God. That is how I will always remember her. Her life was, in so many ways, the Way of Simplicity. Her kind of simplicity is what most of us cannot and will not ever understand. She had an unwavering focus … and that focus was simply to love God and to absorb God’s love into her whole being. I really respect that. I do believe that we can rely on her now to pray for us as we journey on our own path of simplicity, love of God and each other. 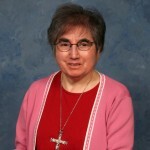 Sister Caroline Silvestrini, GNSH, formerly Sister Marie Anthony, 71, died December 14, 2015 at Abington Hospital. After serving her sisters and retreatants faithfully as a cook for twelve years, Sister Caroline was a teacher’s aide at St Ann’s Hall, Melrose Academy for four years. Becoming a professional beautician in 1985, she provided services to her sisters for 25 years. Sister Caroline especially took pride in washing, cutting and styling the hair of Sisters for special occasions. In 2010, health issues necessitated her retirement to Willow Lake Residence, Willow Grove, PA.
Born in Torre Dei Nolfi, Italy, Sister Caroline grew up in Philadelphia when the family immigrated to the United States. She attended Immaculate Conception School and graduated from Cardinal Dougherty High School; she became a naturalized citizen in 1962, two years before she entered the Grey Nuns of the Sacred Heart. In addition to her religious community, she is survived by two sisters, Maryann Nespola and Pauline Iacobelli, two brothers, Larry Silvestrini and Attilio Silvestrini, and several nieces and nephews. A prayer service will be held at 7:00 PM on Thursday, December 17, 2015 in the Grey Nuns of the Sacred Heart Motherhouse Chapel, 1750 Quarry Road, Yardley, PA 19067. The funeral Mass will be celebrated at 10:45 AM in the chapel the following day with burial in Resurrection Cemetery. Arrangements by Beck- Givnish, Inc. Contributions in her memory may be made here Grey Nuns of the Sacred Heart online, or by mail at the above address. I really liked Sr.Caroline she was so sweet.im just reading the obit. and wanted to express my condolences. I did not know her, but I attended Melrose Academy from ’50 thru ’52…left after 9th grade. Want to know what happened to the mansion on the hill that housed the high school. Went back and visited around ’81 and it was gone. The nun I spoke to said there had never been one, but I know there was a mansion. Sister Caroline was a fear friend and prsyer warrior. She lived het life for Jesus Christ.